With each new tax year there will be changes, it’s worth understanding what the new tax year means for you. Being aware of these changes and how they impact you is important to ensure you are making the most of new allowances and so you can meet your tax planning objectives. Don’t forget that just because the 2018/19 tax year has ended, it’s not all over on 5th April. You may still need to file a Self Assessment Tax Return / P11D form, making sure you’re up to date is key to ensuring HMRC deadlines are met to avoid penalties. April is a great time to get ahead with 2018/19 Self Assessment Tax Returns that need to be filed before 31st January 2020. Normally during April and May you’ll receive annual interest statements from banks or dividend vouchers / statements from your investments. Make sure you keep this information safe as it’s needed for your return. If you have a rental property, you’ll also want to be compiling your records for the tax year in readiness for your Self Assessment Tax Return. Shortly after the start of the new tax year, when you log in to inniAccounts you’ll be able to tell us if you would like us to complete Self Assessment Tax Returns for the members of your company. Simply complete and submit the questionnaire on your dashboard along with sending us any additional information. Due to the large number of returns we have to prepare, we complete them on a first come first served basis. Please submit the questionnaire on your dashboard and send us additional information before 31st October to benefit from our discounted fees and to avoid additional charges. If you or any of your employees have enjoyed the benefit of something paid for by your company during the tax year, a P11D must be submitted to HMRC to declare the ‘benefit in kind’. Common taxable perks include company cars, gym memberships, directors loans over £10,000 and medical insurances / treatments. The majority of individuals won’t need a P11D. When someone does receive a benefit the company will pay class 1A National Insurance (13.8%) on the value of the benefit and the employee’s tax code may be adjusted meaning additional income tax will be deducted from their salary. Shortly after the start of the new tax year, on your dashboard you’ll see a questionnaire about personal benefits. Take a look to see if anyone in your company needs a P11D and answer the few simple questions to confirm. If you need one, we can take care of it for you. We need you to let us know by 31st May if you’d like us to take care of your P11Ds in time for the HMRC deadline. When running your own business it’s good practice to plan your income for the tax year. 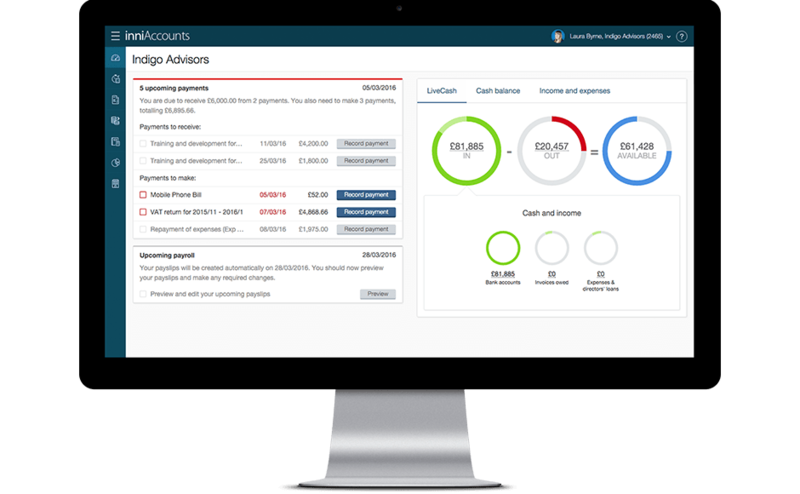 Here we explain how to decide your plan then configure your company payroll and Personal Tax Planner. inniAccounts has been updated with 2019/20 rates and thresholds and we’ve recalculated the Employment Allowance. We’ll update each of your tax code in line with HMRC’s instructions. Many business owners aim to minimise their higher rate tax liability by keeping their income for the tax year within the basic rate tax band. Whatever your plans and aims for the new tax year, be sure to capture them in your Personal Tax Planner to get a clear estimate of your tax; so there are no surprises. You can use the Personal Tax Planner to understand the tax impact on your company’s salaries and dividends. You can also try out different scenarios and instantly see the impact on your net income. Click here to open your Personal Tax Planner and plan for the 2019/20 tax year.